Tension ran high in Rangamati and Khagrachhari as indigenous people and Bangalee settlers brought out processions and held rallies yesterday blaming each other for Saturday's violence that claimed two lives at a Rangamati village. Around 7,000 indigenous people, led by Parbatya Chattagram Jana Sanghati Samity (PCJSS) leaders, marched in procession to the Rangamati deputy commissioner's office and submitted a memorandum to the premier through the DC demanding parliamentary enquiry into the incidents. Their other demands include publication of an accurate report on the incidents after a probe by a parliamentary enquiry committee, arrest of the culprits and their exemplary punishment, providing treatment to the injured, compensation to the affected indigenous people, withdrawal of army from Baghaihat, removal of cluster villages of settlers from Baghaihat and scrapping of "Operation Uttaran" in the CHT. Meanwhile, the Upazila Nirbahi Officer of Baghaichhari, Humayun Kabir was withdrawn yesterday allegedly for his controversial role in Saturday's incident. Bashirul Haq Bhuiyan, senior assistant commissioner of Shariatpur, will replace him. Parbatya Bhikkhu Sangha Bangladesh, a body of Buddhist monks in CHT, also submitted a memorandum to the prime minister through the Rangamati deputy commissioner protesting the Baghaihat incident. Samo Odhikar Andolan and Parbatya Bangalee Chhatra Parishad (PBCP) brought procession and held protest rallies in the town blaming indigenous people for the arson attacks on Friday and Saturday. They claimed that indigenous people first set the settlers' houses on fire. In Khagrachhari, indigenous people under the banner of United Peoples Democratic Front (UPDF) hoisted black-flags at several places in eight upazilas protesting the Baghaichhari incidents. The UPDF, which opposes the peace accord, called a daylong road and waterway blockade in Khagrachhari and Rangamati today. It will also hold a candle-lit vigil on February 24 and a protest rally on February 26. The organisation urged indigenous students to boycott classes on Thursday in all educational institutions in CHT to protest the incident. The UPDF held a rally at Swanirbhar Bazar with its district coordinator Ujjal Smrity Chakma in the chair. Organising secretary of central committee of Hill Women Federation Rina Dewan and Pahari Chhatra Parishad secretary Aprushi Marma also spoke. The PCJSS leaders at the rally in Rangamati blamed Bangalee settlers for arson attacks and violence in nine Baghaichhari villages and alleged that army abetted the settlers. They said the incident would have never happened if the army had played a neutral role. Army men shot the indigenous people and instigated settlers to set fire to the houses of indigenous people. The PCJSS leaders also demanded punishment of Lt Col Wasim, zone commander of Baghaihat zone, saying army men opened fire on indigenous people in his presence. They said the main reason of unrest in the hill region is the army and peace will prevail there if they are withdrawn. The PCJSS leaders demanded suspension of "Operation Uttaran" by the army, immediate withdrawal of army men from Baghaihat and deployment of additional police forces instead at Baghaihat to restore peace and communal harmony between indigenous people and Bangalees. The rally was presided over by PCJSS Vice President Laxmi Prasad Chakma. General secretary of CHT Mohila Samity Suprova Chakma, PCJSS information and publicity secretary Sajeeb Chakma, its district unit secretary Bodhi Satta Chakma and Pahari Chhatra Parishad president Udayan Tripura also spoke. 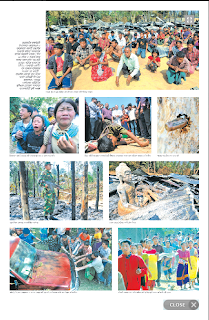 Picture (courtesy Daily Kaler Kantho): The photos above depict the aftermath of communal attack against Indigenous people of CHT. ( villages completely destroyed in the attack. Till today (on 22 February 2010) the section 144 is still going on. Due to continuing section 144, the Jumma villagers could not trace out dead bodies of the killed. Today in the morning, Bengali settlers ran after some of Jumma villagers who went to see ablaze village of Nayapara Guchhagram. However, they could narrowly escape. On the other, Bengali settlers set fire a fruit garden funded by UNDP at Gangaram. It is learnt that the outpost of military forces was closed down and Bengali settlers numbering 12 families were withdrawn from Gangaram Duar area though other Bengali settlers are still there along the roadsides. It is mentionable these Bengali families settled there soon after arson attack on 7 Jumma villages on 20 April 2008. 6) Mr. Debendra Chakma of Nagalmara. Today (on 22 February 2010) PCJSS organised protest meeting in Rangamati and Bandarban district and submitted a memorandum to Home Minister through concerned Deputy Commissioner. In Rangamati, vice chairman of PCJSS Mr. Laxmi Prasad Chakma was presided over the protest meeting which was held at the premises of Deputy Commissioner’s office in Rangamati. Among other, general secretary of PCJSS district branch Mr. Badhi Satta Chakma, president of PCP Mr. Udayan Tripura and general secretary of Mahila Samiti Ms. Suprava Chakma et al delivered speech while assistant information secretary of PCJSS Mr. Sajib Chakma contacted meeting. PCJSS demanded, among others, to conduct judicial inquiry; to arrest the culprits and prosecute exemplary punishment to them; to provide proper compensation and rehabilitation to the affected Jumma villagers including proper treatment to the injured persons; to withdraw Baghaihat army zone of 14 Bir Bengal; to close Bengali settlers to cluster villages and to implement the CHT Accord including withdrawal of all temporary camps. Several monks of Parbatya Bhikkhu Sangha also attended the protest meeting in Rangamati district. They, on behalf of Bhikkhu Sangha, submitted a memorandum to the Home Minister through Deputy Commissioner of Rangamati district. Meanwhile, civil society members, in a press statement, condemned and expressed deep concern over violent attack on Jumma peoples. They also demanded judicial inquiry into the incident. The signatures were, among others, Prof. Mong Sa Nu, Advocate Jnanendu Bikash Chakma, Sukumar Dewan, Nirmalendu Tripura, Bijoy Ketan Chakma, advocate Susmita Chakama et al. In Bandarban, presided over by president of PCJSS district branch Mr. Sadhuram Tripura, the protest meeting was addressed by assistant general secretary of PCJSS Mr K S Mong, assistant organising secretary of PCJSS Chinghla Mong Chak, PCP leader Nitya Tanchangya et al. On the other, Hill Students Council (PCP) orgnised protest meeting in front of Aparajeyo Bangla at Dhaka University. Presided over by PCP leader Mr. Prasenjit Chowdhury, thousands of students and youths attended the protest meeting. Leaders of the several student organisations, such as, Bangladesh Indigenous Student Action Council, Bangladesh Garo Chhatra Sangathan, Garo Students Union, Tripura Students Forum, Bangladesh Marma Students Council, Bangladesh Rakhaine Students Council, Barman Chhatra Sangathan, Santal Students Union, Bawm Students Association, Bangladesh Rakhaine Student Union, Chhatra Front and Chhatra Union attended the meeting. The said student organisations jointly submitted a memorandum to the Home Minister through Home Secretary (at Bangladesh Secretariat in Dhaka) demanding to conduct judicial inquiry to the incident; to send a parliamentary team for on-site visit of the spot and to prosecute those who are involved with this attack; to provide adequate treatment to the injured persons and proper compensation to the affected villagers; to stop land grabbing by Bengali settlers and to rehabilitate Bengali settlers outside CHT with dignity; to investigate and to ensure trial of all incidents of human rights violations; to declare roadmap with timeframe for implementation of CHT Accord soon; to withdraw all temporary camps including de facto military rule ‘Operation Uttoron’ as per CHT Accord.